I love Metro Manila during Holy Week. Barring the heat and crowded churches, everything else seems so peaceful what with the mass exodus of people from the metropolis. We didn't make any travel plans this year, but it got me to thinking about packing for out-of-town trips anyway. After living out of a suitcase for 6 months, I think I have it down, somewhat. Above are the non-makeup beauty stuff I took with me on a three-week trip to NYC, where I stayed with my good friend and her very talented sister Sarah. I was there for interviews, where you only get one chance to make a good impression, hence all the extra hair paraphernalia. Read on for my choices! I try to use a heat protectant spray every time I heat-style my hair, because it can get dry and brittle really fast. Though technically not travel-sized, I brought along this Prostyle Fuwarie styling mist (for curly hair) that I got from our local Beauty Bar (yay!). You spray it generously over dry hair before styling. I use it for curling and straightening; don't see a difference. And while it doesn't do anything for the longevity of the style, I do feel that my hair is more dry when I don't use it. Isn't this teeny little spray can of L'Oreal Elnett Satin Extra Strong Hold hair spray the CUTEST thing EVER! This has gained somewhat of a cult status, tagged the hairspray of choice" for fashion shows and red carpet events. I like its very fine micro diffuser spray, which gives a soft shiny finish. For Victoria's Secret-ish curls I run a brush through my hair after spraying this on and it's OOH LALA. While it doesn't last ALL day in Manila humidity, it holds for a pretty solid 6-8 hours before curls start to droop. If I feel like sporting looser waves the next day, I just spray a bit of Batiste dry shampoo on my roots and sort of ruffle it out. It absorbs the oils and hair looks soft and fluffy again! 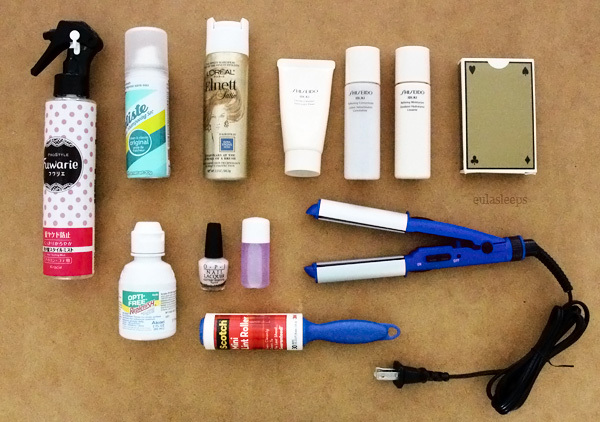 That little blue rod is a generic travel straightener-curler combo from CVS. It doesn't work as well as my favorite Remington barrel, but it makes do in a snap. It doesn't heat up enough for proper curls but it's great for straightening and smoothing. Ahh, my favorite Muji Cleansing Oil. Nothing else removes my makeup so effectively yet gently. I've gone through 3 big bottles already; click the link for a full review. I was road-testing the Shiseido Ibuki Kit at the time, and you can click the link to see my thoughts. Spoiler alert: it didn't work for me. For extra points on grooming, I had with me an OPI mini in Don't Burst My Bubble along with some "depotted" (debottled?) 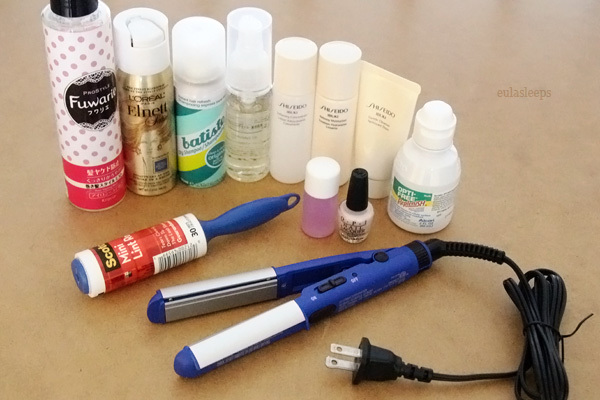 nail polish remover, a mini lint roller, and of course contact lens cleaning solution. A pretty modest bag of tricks compared to my first travel kit!